In yet another ground-breaking first, C.K Magma has launched a Technician’s Rucksack Plus, further enhancing its exceptional range of premium storage, truly setting it apart from the competition. 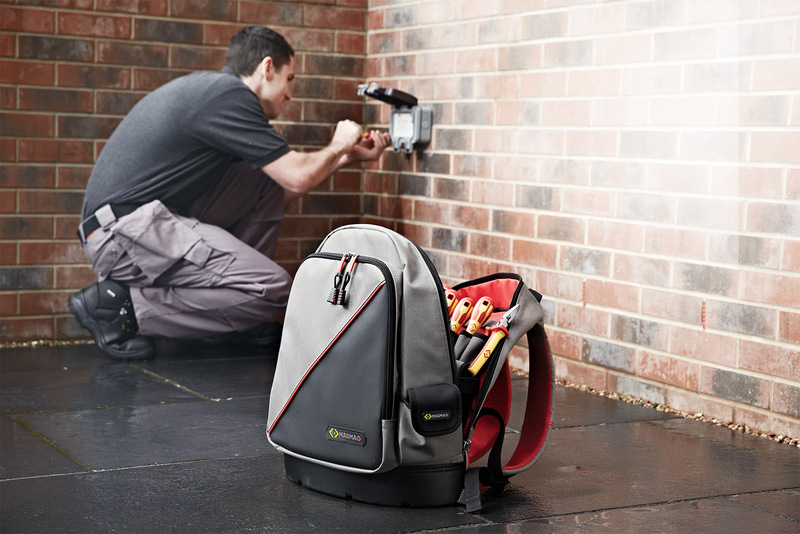 Following in-depth research amongst tradesmen, the truly unique C.K Magma Technician’s Rucksack Plus features a wealth of new, durable enhancements, developed in line with the working needs of tradesmen. In an industry first, a unique lockable zip system will keep the Technician’s Rucksack’s reinforced pockets secure whilst on site or in transit to prevent tools escaping or indeed, opportunist thieves from striking. Tradesmen cited this unique feature as a must, following security concerns whilst on site. To maintain peace of mind, the hardwearing Technician’s Rucksack Plus will be launched with a limited offer of a FREE Kasp 20mm Aluminium padlock worth £5.74 RRP, ex VAT. Understanding the often mucky conditions of building sites and industrial environments in which many electricians, engineers and technicians work, the exceptional C.K Magma Technician’s Rucksack Plus features a 100% waterproof and crackproof, polymer base designed specifically to keep tools protected and dry when placed on wet surfaces. C.K Magma’s polymer base will not crack or split on impact, even in the cold. This innovation is not only easily wiped clean but also prevents scratches and scuffing, meaning the Technician’s Rucksack Plus stays smarter for much longer. This revolutionary rucksack works even harder, keeping tools and documents secure and easily accessible, thanks to a durable polyester construction, a tough, padded front pocket for test equipment, an A4 notepad or iPad, along with an internal zipped document pocket and 39 pockets and holders, including extensive space in the base for heavier tools. A reinforced shoulder strap delivers additional strength and durability to easily move tools on the job, whilst an ergonomic contoured shape base and back with extensive padding provides additional comfort whilst being carried. Created for today’s business focused tradesman keen to present a polished, professional image, the highly functional C.K Magma Technician’s Rucksack Plus exudes proficiency, delivering a total package for the image conscious tradesman. Combining optimal functionality with creative style, this durable rucksack is designed to get the job done in style. Built to survive the rigours or every day work the new C.K Magma Technician’s Rucksack Plus provides all the functionality, comfort and protection trade professionals need. Never one to rest on its laurels, C.K Magma runs an ongoing intensive product development programme investigating potential and reviewing existing product lines. The C.K Magma Technician’s Rucksack Plus, which will be available alongside the existing and popular C.K Magma Technician’s Rucksack, is yet another result of this invaluable collaboration, delivering even greater and longer lasting performance than ever before. Feedback on the C.K Magma Technician’s Rucksack Plus has been phenomenal with 88% of end users believing this exceptional storage solution is a highly functional, premium quality rucksack with unique features that outperform other leading brands. End user comments included: “A very robust rucksack with lots of features.” And, “It’s a fantastic bit of kit; all the internal pockets and holders are perfect for storing tools and meters etc. The waterproof base is great and it’s comfortable to wear.” All further testimony to the expected popularity of this exceptional tool storage solution. For more information or to find a stockist click here or call C.K Magma on 01758 704704.